In Y5 English your child will be using prefixes and suffixes to spell words correctly, analysing texts and punctuating with speech marks and apostrophes. 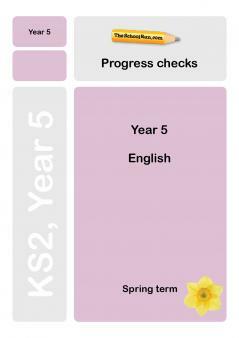 Check that they're on track with our Y5 English Progress checks, written by a KS2 teacher to help you identify any topics your child finds tricky and might need extra help with. Our Y5 English Progress checks, prepared by a KS2 teacher, have been written to help you understand where your child might need extra support and practice to help boost their confidence with literacy skills. The tests cover spelling, grammar, punctuation, handwriting and text-level work. carefully structuring texts with a range of organisational devices, including time connectives, paragraphs, headings, bullet points, underlining. For more information about what your child learns in Year 5 English read our parents' guide; you can also browse all our Y5 English worksheets or follow our Learning Journey for Y5 English.